We mentioned in a previous post that our romantic plans of checking into what we’ve called “our room” at the Pendini Hotel in Florence, where we’ve stayed each time we visited the city, were scuttled by lack of availability even four months out. The inability to spend the week in a room that had been very sentimental to us led us to try to something new. We decided to forego the hotel and rent an apartment, courtesy of Apartments Florence. The cost for a studio apartment seemed to run equal to a hotel stay in the historic city, so we decided to give it a go and we were blown away with the results. The apartment we rented was on the second floor (the third floor to us in US because they count the ground floor as 0 not 1). We had a small balcony accessed through a floor-to-ceiling glass door that was perched over the Arno River and had a stunning view of the Ponte Vecchio and the skyline of the city. The apartment itself was approximately 400-500 square feet studio with a kitchenette and bathroom, decorated in a sleek modern design with white cabinets and large white leather sofa and a small glass dining table. We didn’t have much in the way of privacy, but we’re not the kind of couple that needs privacy from each other. The wifi was pretty good and was even fast enough to stream video (from sites that were accessible from Europe). We spent a good bit of our time in the evening sitting on the balcony nibbling our way through a block of parmesan and drinking red wine as we watched the rowers paddling up and down the river and the pedestrians walking across the Ponte Vecchio. We were often serenaded by bands set up mid-span on the bridge playing a various pop hits (a lot of U2 covers) from dusk to early evening. We were in the heart of Florence and loved it. If we needed something we could go across the street to the supermarket, or to the gelateria next door. We were above one café and down the street 100 yards from the café at the end of the Ponte Vecchio aptly named the Ponte Vecchio Café. Amanda and I mused again and again on how we loved the neighborhood and could easily live in that little apartment for a year or more, if only we could import our cat Storm. We had friends staying in the Pendini and that gave us an excuse to drop by our favorite hotel. I could see down the hall from the front desk the door to our old room was open and the housekeeping cart was outside. So I had to take a peek at our old room. But it wasn’t our room; it had been renovated completely. The old brass bed was replaced by a modern one, the bathroom with the pink tile had been torn out and relocated to the opposite side of the room, the dimensions of the room were significantly smaller. The wooden French door to the room, that I had clanged Amanda’s head into on our honeymoon, was even replaced. The radiator we clipped our engraved lock to on our 5-year anniversary trip was gone as well. The room that was ours was gone. I am left to think that we weren’t meant to go back to “our room.” We’re older now, and were meant to move forward and try something new. I am most definitely happy we did. The apartment was perfect for us. We have no complaints and would rent again. But you have to be willing to put up with street noise. We could hear all sorts of traffic from across the Arno, especially the ambulances. We don’t mind that, we live between train tracks and a busy bridge at home. 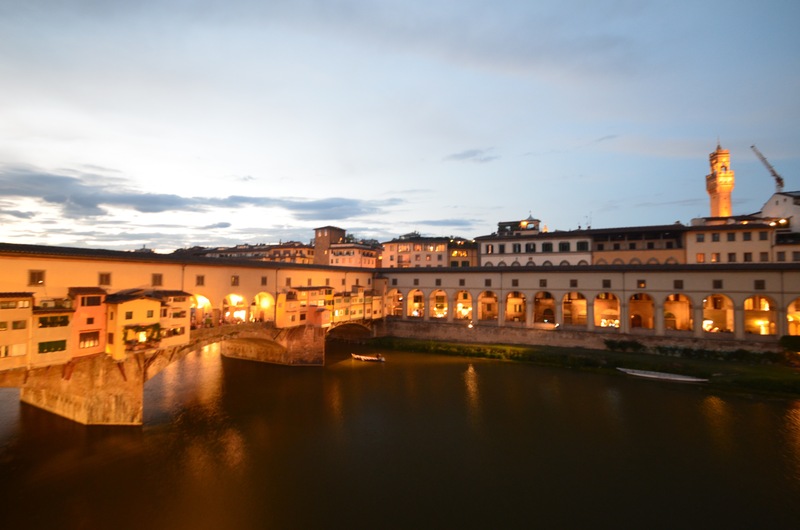 You will also have to cross the Ponte Vecchio and fight through its constant crowds frequently if you don’t want to walk all the way to the Santa Trinita Bridge several blocks away to get to the other side of the river. We were perfectly happy with all of this and happily recommend the apartment, but if those factors would drive you nuts you may want to look for another place. Fortunately, Apartments Florence has 300 apartments available throughout the city! We were amazed at how good it was. It was like a dream. Yes, it was amazing. We would rent that place for a year if we could.